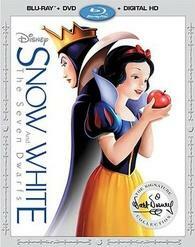 'Snow White and the Seven Dwarfs' marks the beginning of Disney's "Signature Collection." Parts of this review have been previously published in the initial 'Snow White and the Seven Dwarfs' Diamond Edition release. This new release contains new special features which are detailed in the HD Bonus Content section of this review. Special Features: In Walt’s Words: Snow White and the Seven Dwarfs – For the first time ever, hear Walt himself talk about Snow White. Reviewing a film like 'Snow White' can be tricky. It's a classic in every sense of the word, and the premiere animated film, as it ushered in what we know today as the animated feature. Walt Disney and his crew created something not only timeless, but technologically marvelous. 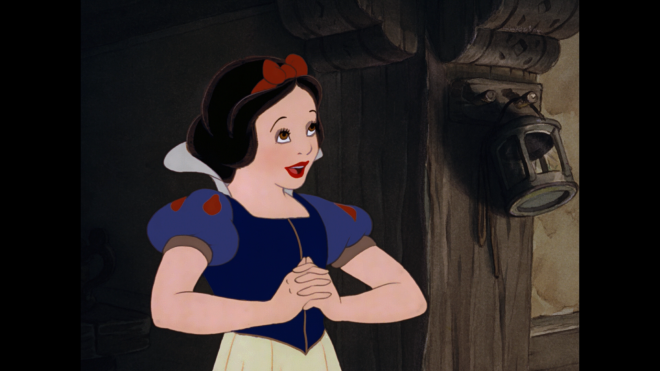 Every animated feature that followed 'Snow White' is inevitably influenced by it. After seventy-nine years it still holds a firm place in American history, and it stands up, even today, as a slice of Americana that serves as a testament to Walt Disney's vision for animation. It was the foundation of Disney Animation, which is referenced by the seven large dwarf statues that act as pillars holding up the Team Disney Burbank building located on the Walt Disney Studios Burbank lot. With the revenue from 'Snow White' Disney was able to purchase the lot and see his vision and company move into a realm no one ever imagined. 'Snow White' is a simple story taken from Grimm's Fairy Tales. 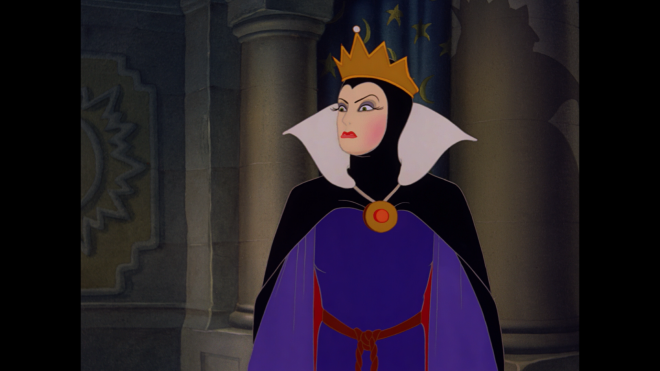 Disney's first princess, Snow White, is threatened by the evil queen because she's much fairer. 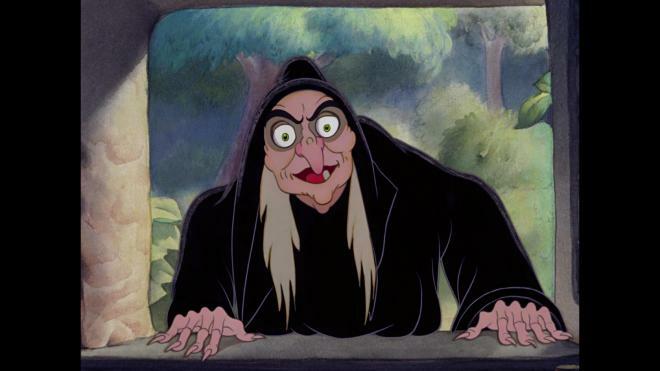 Snow White soon meets up with a band of seven dwarfs who befriend her, hoping to save her from the evil queen. Taking things into her own hands the queen prepares a poisonous apple to give to Snow White that will put her into a deep sleep. The seventy-nine year old animation stands up beautifully, even today. It's a momentous achievement any way you look at it. The visuals of the cell animation are intoxicating. The now iconic music is still as lively and as fun as remembered. The one thing I caught on to more during my most recent viewing of the film is how funny it actually is. I don't much remember the humor from past viewings, but watching it over again, there's quite a lot of subtle comedy woven throughout the story and script. This is why the film itself is hard to review: Sure it's a simple story with simple characters, but it has grown into such an icon that it's simply hard to quantify with a star rating. Suffice it to say that 'Snow White' will forever remain not only the most influential animated film of all time, but one of the most revered films in cinematic history. It paved the way for every animated feature we see today. This is the same video presentation provided by the Diamond Edition. Considering the age of the source materials, Disney's preservation efforts have made the film look pristine and new. 1080p/AVC-encoded transfer of 'Snow White' is a technological marvel. Disney's newly enhanced restoration of this classic has truly given it new life. Colors are so bright and vibrant you would think this had been animated yesterday. I strained to find any type of errant noise or dust flecks, but came up empty (there are a few minor flecks during the beginning credits, but that's easy to let slide). There are times when it looks as if a character is encircled by some nasty edge enhancement. Fear not though, this is simply a byproduct of the original cell animation, and shouldn't count towards a lower score. One of the biggest achievements of this masterful remaster is the consistency of the light source. Animation, especially cell animation this old, usually suffers from an inconsistent light source that causes light to dim and then brighten again. Nothing even close to that happens here. The picture is always well lit. The edges are distinct and concise. Blacks are optimum, and fine detail gives us a feeling of the true beauty of Disney's original cell animation. Have you ever been in a Disney gift shop and seen an immaculate cell painting hanging on the wall for some ridiculous price? The painting is perfect in every way, like it was painted just yesterday. That's what you can expect from this transfer. This is the same audio presentation provided by the Diamond Edition. Created from an original mono track, Disney's DTS-HD Master Audio 7.1 audio track is only slightly less impressive than the video transfer. That's not to say this isn't a stellar track, because it is. It's just not quite perfection. The sound has been mixed extremely well. It never, at any point, feels like a forced 7.1 track. When mixing something from a mono source, if not careful, the surrounds could end up feeling unnatural. 'Snow White's audio track however, never puts forth that feeling. It's a very natural surround sound experience. Dialogue is clear through the front channels, but at times there are slight directionality issues. The surround channels are relegated to mostly providing light ambient noise and also helping with a lot of the film's music. LFE is somewhat underpowered, only really coming to life during strikes of lightning and claps of thunder. Fans of the original Disney songs will be ecstatic to here them remastered here in 7.1. "Whistle While You Work," particularly, has an all encompassing feeling as whistles from the dwarfs echo around you. In typical Disney fashion, leaving no stone unturned, a restored version of the original mono track is also included for those that feel the need to watch this classic the way it sounded seventy-nine years ago. As seems to be the custom at Disney is that whenever they bring out some new edition of an already-released movie, they end up adding new special features and leaving others off. The Diamond Edition of 'Snow White' was packed full of features. Here we only get a small offering of what was offered there. Audio Commentary – The commentary provided by film historian John Canemaker from the Diamond Edition has been preserved for this release. Hyperion Studios Tour (HD, 31 min.) – The Hyperion Studios Tour on the Diamond Edition is an expansive feature comprised of different sections. Here we only get a small helping of what was offered before. We get the following featurettes: "Decoding the Exposure Sheet," "'Snow White' Returns," "Story Meetings: The Dwarfs," "Story Meetings: The Huntsman," "Deleted Scene: Bed Building Sequence," "Deleted Scene: Soup Eating Sequence," and "Animation Voice Talent." No new video. No new audio. Missing special features. Some new special features, but ones that don't really inspire a double-dip. Sure, this release of 'Snow White' contains a Digital Copy, but is that enough justification for releasing another copy of 'Snow White'? While it gets high scores all around, this one isn't worthy of a double dip. It's hard to see a reason why this was re-released, or a reason why people should be excited about Disney's new "Signature Collection." It's for Disney completists only.